Specially designed to cook large quantities of food quickly and economically. Saving of 46-57 Percent in gas consumption. Made from reinforced fiberglass for extra strength and for heavy duty. It also can be used on coal burning or firewood stoves. Restaurants, hotels, canteens in factories, hospitals, schools and colleges, Canteens in many civil or military government establishments. 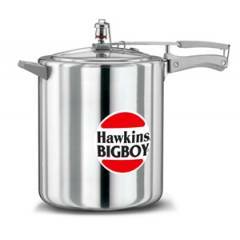 Hawkins Bigboy 14 Litre Pressure Cooker, E00 is a premium quality Pressure Cookers from Hawkins. Moglix is a well-known ecommerce platform for qualitative range of Pressure Cookers. All Hawkins Bigboy 14 Litre Pressure Cooker, E00 are manufactured by using quality assured material and advanced techniques, which make them up to the standard in this highly challenging field. The materials utilized to manufacture Hawkins Bigboy 14 Litre Pressure Cooker, E00, are sourced from the most reliable and official Pressure Cookers vendors, chosen after performing detailed market surveys. Thus, Hawkins products are widely acknowledged in the market for their high quality. We are dedicatedly involved in providing an excellent quality array of Hawkins Pressure Cookers.